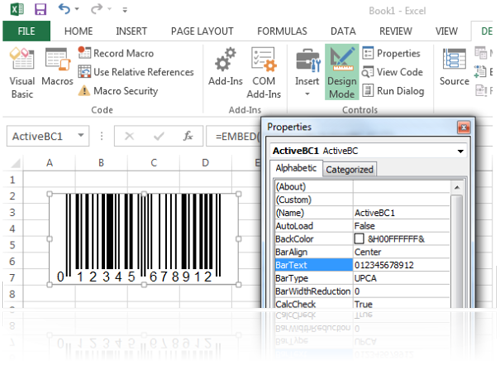 You can use BarCode-ActiveX in most popular applications (e.g. Office, Excel, Word, Access, VB, VC, Delphi, Lotus Notes, WordPro, Quattro Pro, Freelance, OpenOffice.org, etc.). 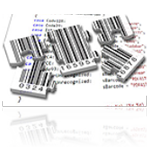 Barcodes can be easily embedded into your document. 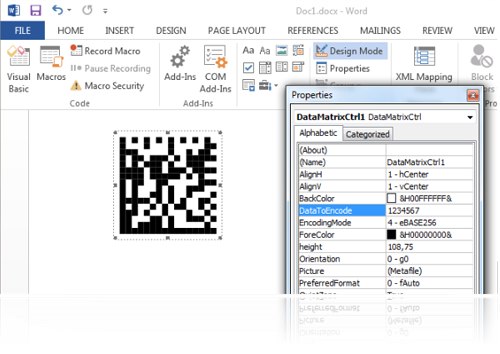 Data Matrix is a two-dimensional matrix symbology containing dark and light square data modules. You can use DataMatrix ActiveX in most standard applications (e.g. Office, Excel, Word, Access, VB, VC, Delphi, Lotus Notes, WordPro, Quattro Pro, Freelance, OpenOffice.org, etc.). Barcodes can be easily embedded into your document. Our PDF417-ActiveX Control has all the features necessary to easily add professional quality barcodes to any Windows application including Web pages, database reporting and labeling, product packaging, document tracking, postal bar coding and special purpose barcode labeling applications. QR Code 2005 is a matrix symbology. The symbols consist of an array of nominally square modules arranged in an overall square pattern, including a unique finder pattern located at three corners of the symbol. A wide range of sizes of symbol is provided for, together with four levels of error correction. MaxiCode is a fixed-size (1.11inch x 1.054 inch nominal) two-dimensional symbology made up offset rows of hexagonal elements around a unique circular finder pattern. A MaxiCode symbol has 884 hexagonal modules arranged in 33 rows with each row containing up to 30 modules. The maximum data capacity for MaxiCode is 93 characters. MaxiCode is used by United Parcel Service (UPS) for package tracking. Our Barcode .NET component is written in Microsoft C# and is 100% managed code. It allows to achieve the complete compatibility with .NET applications. Our Barcode .NET component increases the reliability and performance of your .NET application and also allows you to use it in the same way as other .NET Framework classes. Compact Framework 2.0 version available. Data Matrix is a two-dimensional matrix symbology containing dark and light square data modules. Our DataMatrix .NET Control is a completely managed assembly. You can use it in any .NET environment. PDF417, or Portable Data File 417, is a two-dimensional stacked bar code symbology capable of encoding over a kilobyte of data per label. PDF417 .NET Control has been designed specially for the use in .NET applications. It is written in Microsoft C# and is 100% managed code. This means the component can be easily embedded into your application, regardless of the .NET environment. Barcode ASP.NET Web Control is a component intended to be used particularly in ASP.NET web applications. Barcode ASP.NET Web Control can be easily integrated with Microsoft Visual Studio. Besides, you can use the control the same as old ASP components using the IMG tag to get a barcode image. BarCode ASP.NET Web Control supports all popular barcode types (Interleaved 2 of 5, Industrial, Code 39, Code 39 Extended, Code 11, Codabar, MSI, Code 128 (Auto, Set A, Set B, Set C), EAN Addon-2, EAN Addon-5, EAN-8, EAN-13, EAN-14, UPC-A, UPC-E, UCC/EAN 128, SSCC-18, PostNet, PlaNet, Code 93, Code 93 Extended, ITF 14). DataMatrix ASP.NET Web Control is a component intended to be used particularly in ASP.NET web applications. DataMatrix ASP.NET Web Control can be easily integrated with Microsoft Visual Studio. Besides, you can use the control the same as old ASP components using the IMG tag to get a barcode image. Our DataMatrix ASP.NET Web Control supports ECC-200 error correction. ECC200 is the newest and most standard version of data matrix error correction. It supports advanced encoding and error checking with Reed Solomon error correction algorithms. These algorithms allow the recognition of barcodes that are up to 60% damaged. PDF417 ASP.NET Web Control is a component intended to be used particularly in ASP.NET web applications. Our PDF417 ASP.NET Web Control can be easily integrated with Microsoft Visual Studio. Besides, you can use the control the same as old ASP components using the IMG tag to get a barcode image. PDF417, or Portable Data File 417, is a two-dimensional stacked bar code symbology capable of encoding over a kilobyte of data per barcode. A CGI (Common Gateway Interface) Application is an application that a WWW server can execute. The easiest way to create barcodes on your web server is to use a CGI application that generates barcodes. 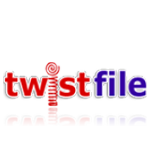 It is enough to install just one executable file on the server. Embedding a barcode into an HTML page is as easy as using IMG tags. Our CGI applications are written in C++ and are executable files, which ensures higher speed and lower load for the web server. Our CGI applications can be used both on the Windows (IIS server) platform and on Linux (the Apache server). 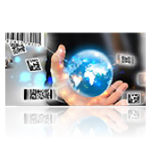 Here you can test our barcode CGI applications. LabelBar(Pro) is designed for creating, editing and printing of labels. The program has a simple and convenient interface, preview of labels location on the page, barcodes adaptation for the current printer resolution, connection to various Data Sources. Linear: Interleaved 2 of 5, Industrial, Code 39, Code 39 Extended, Code 11, Codabar, MSI, Code 128 (Auto, Set A, Set B, Set C), EAN Addon-2, EAN Addon-5, EAN-8, EAN-13, EAN-14, UPC-A, UPC-E, UCC/EAN 128, SSCC-18, PostNet, PlaNet, Code 93, Code 93 Extended, ITF 14.